Reunion mythology is a powerful force in the music industry. It can artificially preserve overripe bands past their sell-by date, or rob stellar releases of thoughtful criticism in favor of tireless gossip. Former bandmates pursuing other projects have to shout louder than their own histories to be heard in a new context. The lionization and dramatization of reunions ignores the fundamental alchemy of all music-making, regardless of chronology: that artists find each other and choose each other, out of all the artists in the world, to create something new every time they interact. Sleater-Kinney didn’t announce any reason for a hiatus that began in 2006, and did nothing to stoke the fires of reunion-mongering in the years since. 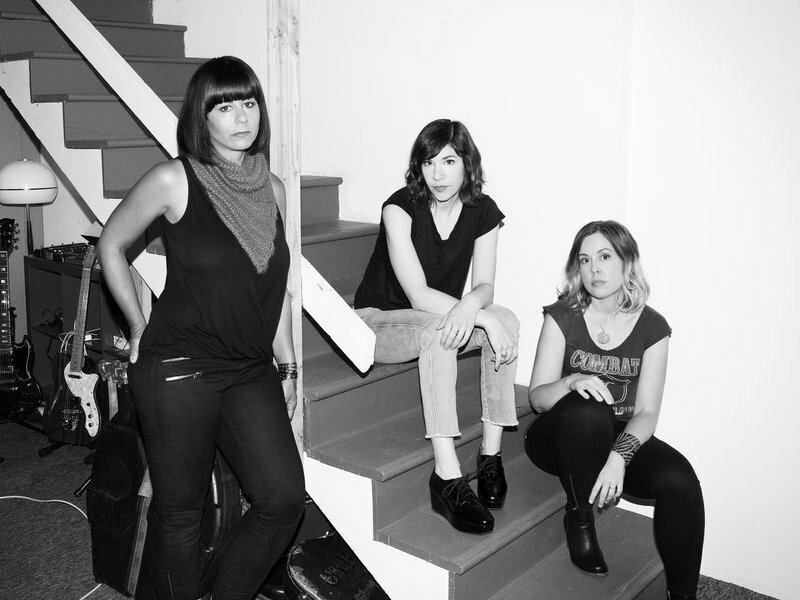 One member of the group — writer, actor and former NPR Music blogger Carrie Brownstein — touched on the importance of getting a band back together for the right reasons in 2008, saying that Sleater-Kinney would release new music only when she, singer-guitarist Corin Tucker and drummer Janet Weiss “felt like there was more of a story to tell … with each other.” All three have experienced tremendous productivity and success in the past eight years: Brownstein formed a new band, Wild Flag, and created the popular IFC series Portlandia; Tucker started the Corin Tucker Band and released and toured two albums; Weiss drummed for The Shins, Quasi, Wild Flag and Stephen Malkmus And The Jicks. The logistics alone of telling new stories as Sleater-Kinney seemed improbable. And yet the band’s eighth album, No Cities To Love, is finally here. It sounds as fresh and vital as a debut, but also as nuanced and skillful as the work of three players with a decade-long, inimitable report betwixt them. This album is a story no one but Sleater-Kinney could have told, and now is precisely the right time to tell it. Tucker’s voice is one we need to hear from female musicians­ — confrontational, attention-demanding, feminist and strong as hell. Brownstein, who also contributes powerful vocals, plays so energetically and with such a palpable sense of fun, it’s easy to miss that she’s one of the most skillful rock guitarists working today. Weiss, too, is a technical giant, giving Sleater-Kinney its punk backbone and the stability to experiment with harder rock or breezier pop, angled over the years and over the course of No Cities To Love. The classic-rock slant to 2005’s The Woods is less prevalent here — though the first seven seconds of “Fade” nod to Guns ‘N Roses — but the accessible, pop-adjacent punk of 2000’s All Hands On The Bad One is audible, particularly in the chorus-centric title track. Ten years and eight albums in, Sleater-Kinney still experiments with and expands its instantly recognizable sound profile with irresistible results. Higher production values, paired with musicians at the top of their game, have added shine to the group’s Pacific Northwest-rooted, riot grrrl-influenced rock without changing its irrepressible heart. If No Cities To Love is typecast as a reunion record, it might lose its poignancy as a portrait of a beloved band growing fully into itself. Yes, the world needed a new Sleater-Kinney record. “Bury Our Friends,” with its grownup vulnerabilities, and “Price Tag,” with its post-recession anxiety, couldn’t have been made any time but now, and exhibit new depths of thematic maturity. But, more than anything else, Sleater-Kinney needed a new Sleater-Kinney record, and its members chose each other all over again to make it. What truer, simpler reunion mythos is there?